The biggest obstacle for me when I first started perch fishing on Lake Saint Clair in Metro Detroit was figuring out where the access points were... hopefully this list can help a new person get started. Blossom Heath Park in Saint Clair Shores--- (Saint Clair Shores park pass required) Turn east off of Jefferson south of ten mile on Blossom Heath Blvd.... follow Blossom heath to the lake. Saint Clair Shores Library at 11 mile ---(Saint Clair Shores park pass required) parking lot in the back of the library- You can access the ice at the boat launch-follow the canal to the marina or out to the lake. Gino's --- (private owned 5 dollars to park) 94 to metro parkway east on metro parkway--take metro parkway all the way to metro park go south on jefferson a half a mile-- location is on the east side of the road. Selfridge DNR launch --- (DNR pass required) 94 to 59 east on 59- follow 59 until you pass the air force base- the launch is on the south of the road. Once you access the ice walk out of the marina area and head south towards the barracks(big white building) or head north to fish. Cotton road --- (limited private parking at Buscemis for 5 dollars) 94 to 21 mile- east on 21 mile- take 21 mile to Jefferson- north on Jefferson to the Buscemis north on Cotton Road. Once you park, walk down Cotton road to the east and there is a walkway to the lake. Brandenburg park --- (township park never manned but if it is 4 dollars to park) 94 to 21 mile- east on 21 mile-take 21 mile to Jefferson- north on Jefferson until you reach the park on the east side of the road. If you go to 23 mile, you went too far. Wait until the ice is thick enough to go a mile straight out from the access. The jumbo perch usually are in the weeds. Fairhaven DNR Launch --- (DNR pass required) 94 to 23 mile- east on 23 mile until you hit the town of Fairhaven- the launch is east of Palms road on the south side of the road next to a bait shop. Head out of the launch to your left and go 3/4 of a mile out to the horseshoe to catch jumbo perch. The Raft bar --- (private owned 3 dollars to park) 94 to 23 mile- east on 23 mile until you hit the town of Fairhaven- go thru Fairhaven until you hit Dyke road- go south on Dyke road- the Raft is to the west of Dyke road. This spot usually is the best ice at first ice. December- I fish the raft or the Crocker DNR launch. January - The first week of January fish the Crocker DNR launch by the Spillway dam and then move to Selfridge for the last couple of weeks. February - Fish either Gino's or Metro park day sail. March- I fish the horeshoe at the Fairhaven DNR launch if the ice is safe. 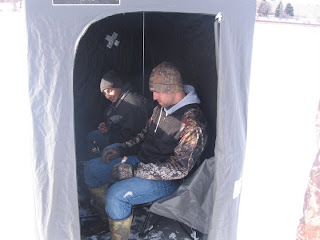 awesome site,exactly what i was looking for as far as info for lake access for ice fishing,see lots of info on ice fishing but dont have a clue where they were talking about,not from the area.This is probably first informational site that was really easy to find and directions are easy for anybody to follow,kudos to you! Thank you very much!!! !